The Monterey Peninsula is home to many of the finest restaurants in the nation. Choose a location or scroll the entire selection below. The best calamari, cooked 8 ways, fresh lobster and abalone. By far the richest and best clam chowder around, a must try. Bartenders are wonderful, and they have the best waitors/waitresses in the area. Great veiw of the sea lions, esspecially when you are outside. Wonderful desert tray. A great Thai restaurant on Cannery. The food is great and even though it is on Cannery Row, it's still pretty affordable. Breakfast scrams, omlets, and Eggs Benedict are yummy...cooked like you want'em and plenty of them. The cafe is a cafe, what can you say about that? But it has a great view of El Estero Lake and Park...watching the Canadian Geese, Mallard, and Coots is a treat. Service is always good. The prices are more than reasonable for the quality and quantity of the food. The experience a complete immersion in European tradition. The tables are close together and the room is small. When it comes to the menu, Bistro Moulin proves that simplicity rivals complexity. Further, Moulin has the confidence not to soothe diners with a sense of abundance through elaborate descriptions of a dish. Finally, Moulin assures that a selection of good wines, not superfluous yet diverse enough to complement the food. Blue Moon Restaurant in the heart of historic Cannery Row. The menu's Pacific Rim theme features seafood, steaks, handcrafted pizzas and innovative appetizers designed for sharing. The new food lineup, as well as many of the old favorites, are complemented by an award-winning wine list (Wine Spectator Award of Excellence for one of the world's best wine lists), full bar and extensive specialty drink menu. Bubba Gump's has a great location on Cannery row. Themed after the movie Forest Gump. Weekends are crowded and can be noisy. Nice choice of food, prices are resonable. Service is very good. View of Monterey Bay is wonderful, very romantic. Cafe Fina, located on the Fisherman's Wharf in scenic Monterey, California, is a four star fine dining establishment. Hidden behind the facade of a to-go pizza counter, this restaurant boasts an outstanding view of the bay, as well as an outstanding menu, a full bar, and an extensive wine list. Cafe Fina has received numerous awards since itâ€˜s birth in 1989. Caruso's specialize in delicious and reasonably priced cuisine, including their house specialties. The entrees are served in a relaxed and welcoming setting that you and your friends/family are sure to enjoy. Whether you are in the mood to indulge in something new or just want to enjoy some old favorites. The Chart House is a large restaurant featuring a steak and seafood menu. The dining rooms overlooking Cannery Row and the waterfront are a wonderful place to enjoy a meal while watching the sun go down. The service and seafood is excellent. This restaurant offers a feeling of the Orient. The staff is friendly, the food is fresh, delicious and always hot. The setting is beautiful, and the prices are reasonable. Cibos offers Italian cuisine with a great environment. Featuring live music most of the week and a bar with a large drink list. The staff is friendly and the essence of romance exists throughout. Picky eaters will appreciate this restaurant's menu; wishy-washy ones are apt to be overwhelmed. There are more than a dozen fresh fish specialties, and that is not including the shellfish dishes. Almost all of the house-made pasta dishes feature some kind of seafood, while the grilled menu sticks with Filet Mignon and other red meat classics. The modern, airy dining room buzzes with activity. Diners ponder the many options or simply slurp down a few savory choices from the raw bar. Offering panoramic views of Monterey Bay, the Duck Club Grill offers innovative cuisine and impeccable service in an elegant ambiance. The distinctive American Grill menu features the freshest local produce, sustainable seafood and oak-broiled steaks. Wood-roasted specialties, such as Steinbeck's Duck and Colorado Lamb Chops, are prepared in the exhibition kitchen using an Italian wood-burning oven. Delectable soups, salads, and "out-of-this-world" desserts are created using only the finest ingredients available. The menu here is packed full of intriguing coastal specialties from South of the Border. The spacious and tastefully decorated interior with its tiered floors, assures one as to the quality of the food the moment one enters. Seafood is rendered into piquant dishes that can be ordered with confidence and that are served graciously. And there is plenty of chicken, beef, pork and a traditional array of enchiladas, chiles rellenos, and pozole, as well. Nor will vegetarians want for menu options. The bar is well stocked a variety tequilas and Mexican beers, as well as fine, locally grown wines. See website for menu, event calendar and more. Bring your appetite to this place for casual, south-of-the-border cuisine and cold Mexican beer. Fresh Mex is whats on the menu along with great views of the Monterey Bay. The full bar serves out-of-the-ordinary drinks like the Pink Cadillac Margarita, served with Blue Curacao and a smidgen of pineapple juice. Wonderful dishes like Mousaka, Spanokopita and the sides and the Greek salad are really good! I highly recommend making reservations, since it gets pretty busy with couples, and large groups of diners. Staff is prompt and friendly and service is immediate upon entering. Overall if you want Greek Epsilon is a good choice. Experience the beauty of the Pacific Ocean, combined with world class dining on historic Cannery Row, within walking distance to the Monterey Bay Aquarium and fine shops. The Fish Hopper, once an original sardine cannery building, offers spectacular panoramic views of the beautiful Monterey Bay from every table. While enjoying a delicious meal, see frolicking sea lions, sea otters at play and even the occasional whale! Great place to go if you want a great pizza and a beer. It's a casual, loud place - great for kids & large groups. Full bar available as well as some pasta dishes. If you want great pizza in the Monterey area this is the place! Waterfront dining on historic Old Fisherman's Wharf. This fine restaurant offers panoramic views of the Monterey Marina. Dine on the freshest of fish while watching the harbor seals cavort, the silent sailing boats and the swooping sea gulls. The atmosphere is unhurried and a wonderful place for relaxing with friends or families. Top quality food and service at sensible prices. For casual fine dining in Monterey, The Grill @ Ryan Ranch serves Pacific Rim cuisine in a warm and comfortable setting. Dinner at The Grill offers a relaxed and casual dining experience. The menu offers such favorites as butternut squash ravioli, Dungeness crab stuffed prawns, Szechwan duck or rack of lamb. Lunch and Dinner. Hula's Island Grill and Tiki Room is an intimate restaurant offering an amazing dining experience in a tropical setting. Voted Best New Restaurant in 1998, we have a passion for fun, friendly, enthusiastic service, the freshest fish, great steaks, seafood, and an overall menu which includes a hint of Asian, a dash of Latin and a touch of Caribbean, all with Hawaiian inspiration. India's Clay Oven is a family owned restaurant that offers the finest authentic delicacies of North India. Located in the heart of downtown Monterey. If you like Indian food this restaurant is a must. Spectacular harbor views from every table. Watch the marine life -- seals, otters, sea gulls and more -- while you dine. For a stunning view of boats docked in the harbor, dine on the outdoor patio. Isabella's Italian Seafood Restaurant and Lounge offers the freshest seafood from our own commercial fishing boats, processed in our fish market, and delivered to your table. Jugem is a little sushi place that may reminded you of Japan, where the "old-style" isn't necessarily "in" and cool little sushi places are trying to look modern with a Japanese flair. The food is elegantly served and extremely fresh, with a variety of unusual combinations. Relaxation is the name of the game at Knuckles Historical Sports Bar. The playful atmosphere of this award-winning sports bar offers a tempting cuisine. Whether you are taking a break from meetings to confer with colleagues over lunch, or gathering with the family for dinner after a day of sightseeing, you'll enjoy a delicious meal in the welcoming ambiance. LALLApalooza Big American Restaurant and Martini Bar is, by definition, a real LALLApalooza, capturing the essence of time when life was BIG: Big Meals, Big Martinis, Big Art, Big Music,Big Happenings! The restaurant is a gathering place for those with a passion for full flavored food, spirits and good company. Restaurant is simply decorated and on a busy street -- but cozy and inviting. Food is wonderful. Dining is cramped and it does get hot in the small dining area. Make a reservation and eat early, otherwise you'll be standing on the "waiting mat" bumping into the people at the table by the door. Wait staff always attentive. Take the influences of the best European and American cuisine, add a delightfully updated Monterey firehouse, combine with great service and you have Montrio Bistro. Montrio features big-city ambience, a comfortable, well-stocked bar and an award-winning wine list. Montrio Bistro's dedication to the freshest ingredients is expressed in its flavorful dishes. The insistence that dining should be casual and fun has made Montrio Monterey's neighborhood bistro and a locals' favorite for all occasions. Chef Teodulo Pinto and his wife Norma Jean have created a dining oasis on North Fremont in Monterey. Chef Pinto supports local organic produce and sustainable seafood. The desserts, sauces and dressings are made in house, as well as the signature pizza bread which Chef Pinto uses to make Norma Jean's delicious luncheon sandwiches. If you have not yet ventured here, the cuisine is reason enough, but the warm hospitality will complete your dining experience. For over 55 years, Old Fisherman's Grotto has been serving great fish, lobster, crab, pasta, chicken, steaks and its famous Original Monterey Style Clam Chowder. It doesn't really matter where you sit, every table has an ocean view. There is a full bar and banquet facilities on site, too. For over 55 years, Old FishermanÂ´s Grotto has been serving great fish, lobster, crab, This legendary seafood restaurant is located at the end of Fisherman's Wharf and its origin goes back to the 1950s. It has been family run for decades, and the service is impeccable. This is the place to get some of the freshest fish around. Teppan tableside dining, fresh sushi, and Japanese delicacies are prepared right before your very eyes. All this while offering magnificent view of Monterey Bay. This is an upscale restaurant in a warm setting. The award-winning chefs prepare each creation of fresh, sustainable seafood and USDA Prime Beef for you alone. The signature Abalone Bisque was served by request at President Ronald Reagan's Inaugural dinners, and the Macadamia-Crusted Mahi Mahi is one of TV celeb Rachel Ray's favorites. The Sardine Factory serves only the best Eastern corn-fed USDA Prime Beef, hand picked and aged to ensure maximum tenderness and flavor. Located on the corner of Highway 68 and Olmsted Road, the warm atmosphere with friendly service is what keeps loyal patrons coming back. Close to the Monterey Airport and a few miles from historic downtown Monterey, Steakhouse Sixty 8 offers classic favorites combining fresh & new flavors. Tarpy's Roadhouse is located in the Ryan Ranch Homestead. The stone house setting offers seven separate dining rooms for your dining pleasure. The patio, surrounded by lush gardens, is the perfect place for lunch or dinner under the stars. Serving up hearty portions of seafood, Black Angus steaks, innovative salads and vegetarian fare there is something for everyone. Turtle Bay Taqueria guests are greeted with a taco bar where meats and seafood are grilled or charbroiled and the tacos prepared as they watch. Recipes from traditional cultures of Southern Mexico and Belize, as well as spices and marinades imported from Mexico, make this a unique dining experience--a fresh, savory, celebration of flavor. Guests can choose to dine-in at the colorful taqueria, on our heated patio, or take their orders to go. Service is always first class. Baja Cantina Restaurant is an authentic Mexican restaurant featuring Oaxacan cuisine. Fun and Casual, 3 miles outside Carmel-by-the-Sea. Featuring classic Car Memorabilia Collection. Great food and better margaritas! Offering Fresh seafood, steaks & pasta with a Caribbean Flair. Full bar, great winelist! Reservations advised. Lunch & Dinner served 7 days a week. New Happy Hour Lunch Menu everyday. Heated Fireplace Patio (pet friendly). Big Sur River Inn offers a full service restaurant and bar. Serving breakfast, lunch or dinner in the historic dining room or outside on the deck, the lawn or along the bank of the Big sur River. Take a seat on one of the bent Willow chairs in the river and let the freshwater cool your feet. Great food, excellent service and warm hospitality. Offering wonderful views overlooking Yankee Point or indoors surrounded by the rustic decor of the California Market Restaurant. There is something for every taste, served in a casual setting. Select from a menu that features Monterey Bay seafood and fresh local produce for lunch and dinner, and Hyatt's Signature Breakfast Specialties, while enjoying views from the large redwood deck or the warmth of the restaurants pot-bellied stove. Casanova is a small delightful place in Carmel Village. The decor in the restaurant is that of a French country cafe, with little nooks, lots of beiges and tans, and French-country art on the walls. The service is cafe-friendly and prompt. The cuisine is surpurb at this popular locals spot, so reservations are essential. In a rustic & romantic atmosphere, Chianti's will transport you to another place and time. Chianti Ristorante serves authentic Italian cuisine with full bar service. Offering fine dining in an elegant atmosphere. In the small courtyard on Lincoln Avenue, this modern, warm and friendly restaurant serving seasonal ingredients from the local region. A wine list features Monterey County wines for a variety of choices. Diners feel comfortable in the casual, relaxed atmosphere. Locals know this is the place to enjoy fine food at reasonable prices. Offering innovative regional cuisine is served at this restaurant on the Quail Lodge property. The menu changes nightly but always includes the best fresh local seafood, vegetables, game and poultry. On any given night, the menu might include fresh-caught fish, free-range poultry, and venison. Wine aficionados will have fun perusing the extensive wine list. Its serene lakeside location makes this a perfect place for a relaxed meal or drink. The Forge in the Forest offers a brick patio covered with ivy and flowers that immediately pleases the eye. Inside, the saloon really looks like a saloon, with long wood tables and an antique mahogany bar. The food good quality and casual in nature. The ambience of the Forge is charming, especially in the Monterey fog. Grasing pairs creative coastal cuisine with the best wines from the Central Coast. Fresh local ingredients, an outstanding wine list, and friendly, professional service is the essence of the experience. Inspired by the international, fresh and cuisine of coastal Mexico. The menu includes traditional favorites as well as fine Mexican regional specialties. The atmosphere is bright and colorful. Il Fornaio is an Italian restaurant, bar, and bakery in the historic Pine Inn Hotel offers authentic Italian cuisine and atmosphere. In the cafe, enjoy morning pastries, coffee, salads, sandwiches, cookies, hearth-baked breads and food-to-go. The restaurant features wood-fired pizzas, rotisserie meats and fowl, mesquite-grilled local fish, and fresh regional pastas. Offering the finest Prime Steaks and Chops, the freshest seafood and a premium wine list, all paired with the harvest of the central coast. Surving regional country-style pastas, cannelloni, osso buco, risotto, crisp-crusted pizzas, local Monterey Bay seafood and traditional Italian homemade desserts. The dishes use seasonal herbs and vegetables from nearby small farms from the Central Coast, as well as locally hand-made mozzarella and goat cheese. Encompassing the feelings of going back to the old country with every visit. The cozy interior of Lugano Swiss Bistro, with its wood paneled walls adorned with Swiss decorations, transports the diner into a chalet high in the alps. You will experience Fondue along with a wide range selection of pasta dishes, unusual Swiss appetizers and a full selection from the saute pan. Choose from fondues, sausages, schnitzels, pastas, steak and polenta dishes. Marinus features local organic, seasonal produce as well as regional seafood and artisan farmed meats. Guests enjoy garden and mountain views as they dine either in the restaurant or on the outdoor terrace. A stunning, 12-foot-wide fireplace with a raised hearth adds to the restaurantâ€™s old-world charm. Offering an array of regional dishes for lunch including colorful salads and a variety of sandwiches. The dinner menu includes fresh local fish, grilled meat entres, gourmet pizza and vegetarian dishes. Some of the favorite dishes are San Joaquin Valley rabbit with tamale dumplings and mango tequila relish, grilled free range chicken with organic vegetables, fresh salmon with spinach and blackened halibut. An extensive selection of wines compliment the menu. Nepenthe is a family owned restaurant in Big Sur. Features California Cuisine -- fresh ingredients, seafood, steaks, and vegetables with world influences. Nepenthe is the dinner restaurant, Cafe Kevah serves breakfast and lunch. The view from the outdoor patio stadium seating looks over 40 miles of California Coast. When the fog rolled in, making it seem that you were eating on top of the clouds! Nico's serves Mediterranean-Italian cuisine in a country cottage dining room or on one of two flower-filled patios. The menu at this Carmel restaurant features salads, sandwiches, pizzas, pastas, steak and Seafood. Pacific's Edge offers a romantic, softly lit dining room with awe-inspiring views of the Pacific Ocean. Its design of rich earth tones, natural woods and stone blends wonderfully with the enchanting beauty of the Big Sur coastline. Boasting a contemporary American cuisine with a French influence, along with an impressive wine and cigar menu. Piatti restaurant offers a relaxed and warm atmosphere where you can dine fireside or on their heated rooftop garden. This Carmel restaurant features regional Italian cuisine, with a variety of signature dishes such as mesquite grilled meats and fish, rotisserie-roasted chicken, wood-oven fired breads, and pizzas and pastas. Portabella offers entrees like Veal San Domenico or Chilean Sea Bass that are perfectly complemented by a huge array of California wines. The service is efficient. Housed in an old-style Comstock building, the restaurant caters to the discerning customer, one who truly appreciates the variety of aromas that pour out of the kitchen as he or she eats at the table. For over twenty years, Rio Grill has established itself as the place to eat exciting food and enjoy a great dining experience on the Monterey Peninsula. This high energy restaurant, located at the mouth of Carmel Valley on Rio Road, has won many reader's choice awards and inspired food critics. Menu highlights include entrees from the wood-burning grill and oak wood smoker, as well as the daily chef's creations. Location is the key at Rocky Point, featuring sprawling views of the pacific coast. Rocky Point's menu offers a selection of mesquite-flavored steaks and fish barbecued over hardwood charcoal, from rainbow trout in a light lemon-butter sauce to a deluxe porterhouse steak paired with mushrooms in sherry and butter. The La Playa Hotel offers a chance to experience beautiful gardens, view Carmel Bay, and a sense of spaciousness not often available in the middle of town. Breakfast, lunch and dinner, features distinctive menus with fresh Monterey Bay seafood and lush Salinas Valley produce that culminate in tasty European creations. Enjoy your meal on the open-air heated terrace, especially at dinner while the sun sets over the Pacific. Tommy's Wok is a small restaurant tucked inside the Redwood Court with all the charm of Carmel. Szechuan, Hunan and Mandarin cuisine is served fresh and natural. Everything on the menu is homemade - no worry here about MSG and other artificial ingredients! Featuring California cuisine with a Caribbean accent, fresh seafood and pasta. Daily specials from the grill spotlight local fresh catch and seasonal fish including sanddabs, salmon, mahi mahi, halibut, swordfish and sea bass. The chef uses only the freshest produce from the Salinas Valley and offers delicious housemade desserts daily. The atmosphere is friendly and casual, serving great food at reasonable prices. 1996 Sunset Dr.
Lattitudes at Lover's Point is located at one of the most picturesque and romantic settings on the central California coast in beautiful Pacific Grove. At lunch, you'll find a wide selection of appetizers, soups, salads, sandwiches, and seafood entrees. A full range of creative seafood dishes are available for dinner. Breathtaking views of the ocean and romantic Lover's Point Park. Passion Fish offers a unique California dining experience with serious food and wine in a fun and casual atmosphere. The ever changing menu offers fresh sustainable seafood, slow cooked meats, farm fresh organic greens, and delectable house-made desserts, complemented with a award winning wine list, priced well below what you might expect. Pepper's offers fresh food, great prices, and a fun atmosphere. From the lively atmosphere to the ambiance and especially the food is top notch at this small attractive, colorful Pacific Grove Mexicali eatery. Courteous, friendly wait staff serve well-prepared, south-of-the-border food. Great mediterranean food in a charming home-like admosphere. Delightful service and reasonable prices ($12-$18 for dinner entree). A relaxed, family friendly alternative. The Red House Cafe has a homey interior, or the option of an outdoor porch with round tables dressed in white tablecloths. Offering breakfast lunch and dinner, boasting wonderful fusion of fresh flavors. This is a wonderful, quaint cafe. Vito and his family prepare their recipes with an old world flair in a casual and friendly atmosphere. Relax and choose from a menu that includes an extensive array of antipasti, fresh fish, chicken, veal, pasta entrees, and an irresistible dessert menu (including tiramisu made from the family's secret recipe). In true Sicilian fashion, no one walks away hungry. Located in the Lodge at Pebble Beach, just off the famous 18th green of the championship Pebble Beach Golf Links, Club XIX is a luxurious restaurant with glorious views of Carmel Bay. Featuring the clean flavors of the season and accented with California style, the food here is prepared with refined French technique. Even the most addicted golfers slow down for a lavish meal at Club XIX. The indoor dining room is small and intimate, while the cozy, outdoor brick patio is warmed by the glow of a blazing fireplace, making either choice ideal for romance. A favorite with golfers and other early risers, you'll find home-style breakfast and lunch, creamy milk shakes, refreshing smoothies, delicious espresso drinks and a full-service bar. This casual restaurant is located above the putting green and overlooks the first tee of Pebble Beach Golf Links along with Stillwater Cove. Serving Breakfast and Lunch. Rich Italian tradition and the casual ambiance of a Tuscan villa combine at PÃ¨ppoli to bring you a memorable dining experience. Named for a wine estate of award-winning vintner Piero Antinori, PÃ¨ppoli pairs a warm welcome with flavorful, rustic Italian dishes and Antinori and other world-class wines. Views over The Links at Spanish Bay and the Pacific Ocean. Chef Roy Yamaguchiâ€™s hawaiian fusion cuisine blends fresh local ingredients with European sauces and bold Asian spices, always with a focus on seafood. Each evening youâ€™ll find a tantalizing range of appetizers, entrÃ©es, fresh fish dishes and desserts. offering great views of the pacific with a relaxed atmosphere. 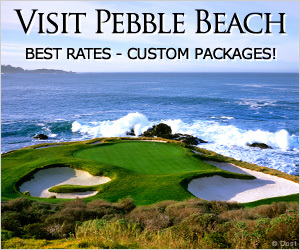 The restaurant is in Pebble Beach, part of Spanish Bay Golf Links. It is very cozy and comfortable, the service very attentive; nice hostess and wait staff. Good breadsticks in the shape of golf clubs are served immediately. The food was fresh and excellent. Great beer on tap accompanies the wonderful view of the pacific. The decor is modern with exposed beams, hanging deco-style lamps and abstract artwork. The menu features an array of creative, mouthwatering seafood dishes such as Oyster Chowder, Cedar Plank Roasted Salmon Roulade and Applewood Smoked Sea Bass. The raw bar offerings change nightly, but there is always a Raw Fish Board to appease the sashimi lovers in the house. There is great service, too. After golf or any time you prefer casual dining, visit the Tap Room, famous for its grilled steak and chops, extensive selection of hand-crafted beers and prized collection of golf memorabilia. Serving Lunch and Dinner.